Purchasing the Browning Recon Force FHD is like getting a $500-camera at less than half the price. It has been completely updated to deliver high quality images that are among the best in the industry. Be amazed with its various features and capabilities that have propelled it to its leadership status in the hunting equipment business. You’ll love to add this device to your arsenal of hunting equipment, as it makes trophy catches more than just the stuff of dreams. With trigger speeds of 0.67 second and recovery times of 2.1 seconds, this camera ensures you won’t miss any action on the field. No action will get by this unit, since it is able to capture images at less than a second when it senses motion. Unlike trail cams that take a longer time to wake up and do image capture, this camera senses movement and in lightning-fast speed snaps a shot. The camera delivers a full series of photos that would easily be missed by inferior-quality trail cameras. The fast camera timeout recovery time ensures less duration to start up and reset, for even fewer missed opportunities. This gives you confidence to position the camera on a heavily used trail or path by deer. Expect exceptionally long battery life on a set of 8 double-A alkaline batteries that you can purchase separately. Under normal conditions, the camera is able to snap from 8000 to 10000 images. This means less frequent battery replacements and savings for you. The trail camera can be left out to take photos and videos under normal circumstances without losing power so you will have collected more than enough images to study before the need to replace the batteries for another round of monitoring in the outdoors. The 12-volt external power jack offers options on the kind of batteries you can put into the device while enabling fuss-free juicing up of rechargeable fuel cells. 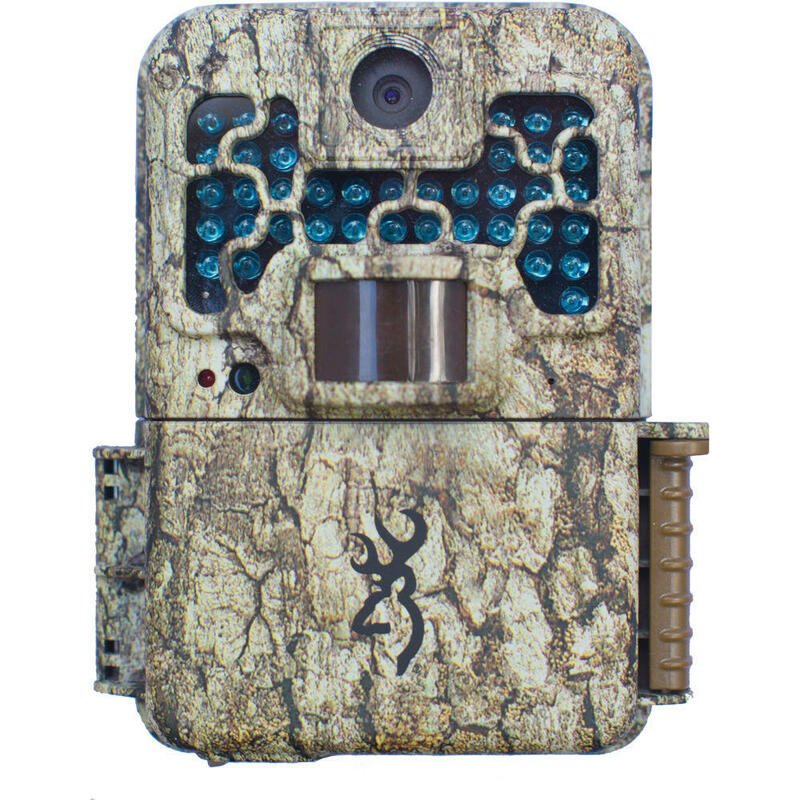 Able to take high quality 10MP images, this trail camera has an upgraded video resolution that delivers up to 1920 x 1080 full high-definition quality, so you can play back recorded video clips of your dream giant buck on a full 60-inch TV or bigger without compromising on image clarity and detail using the TV out on the unit. Thanks to the infrared flash, your game will be adequately illuminated in photos with a coverage of up to 100 feet at night. And that even comes with sound so you can enjoy genuine surveillance on videos that last between 5 and 120 seconds. The impressive detection range of 55 feet ensures that the deer is sensed even when it’s not directly in front of the camera. The Browning Recon Force FHD snaps up to 8 multi-shot images at a time so no movement is missed so easily. It boasts the cutting-edge “Zero Blur” technology that enables it to capture photos at night using the fastest shutter speed that gets rid of annoying motion blur resulting from the movement of animals at night. Images will not suffer from degradation. If you have the camera set to 6 MP, every picture taken in rapid fire Burst Mode will be at 6 megapixels. With a compact case size measuring 5” x 4” x 2.5”, this exceptional device enables easy packing along with your other hunting equipment. It won’t take up much space and is also easy to mount with its small footprint. You won’t have to worry about placement since the unit features a smooth camo finish that makes it easily blend in with the surroundings, making the camera virtually undetectable by the wild game as well as other hunters. You can see the time, date, temperature, camera ID and moon phase displayed on the picture information bar for easy identification and effortless monitoring. The camera has programmable picture delay between 5 seconds to 60 minutes so you can set it to snap pictures only at specific times of the day. Able to support up to 32GB SD card, this trail camera lets you store a huge number of images and a large amount of video so you won’t need to revisit it and check frequently to ensure that it still has enough storage space left on a separately bought SD card. The included Browning Buck Watch Timelapse viewer software ensures that you can observe images at preset intervals within the specific times of your choosing for optimal image capture. The ¼-inch-20 tripod socket enables easy mounting on a tripod for distant observation. The onboard advanced IR illumination technology takes over when it gets dark, so the game is discreetly illuminated without spooking the animals off due to a bright flash.